The first metronome was invented in Germany by Johann Nepomuk Mälze. Many well known composers and musicians have used a metronome at some point in their lives, simply because it makes it easier to keep time with the composition of the music. Metronomes are great for beginning musicians as well as seasoned professionals, but how do you know which metronome is best for you? Should you invest in an analog or a digital model? What features do you need to prioritize with your purchase? As a musician, I know that this task can be tough, so we have comprised a list of considerations that you should make before purchasing a metronome. We have also selected a few of the best metronome options on the market today for you to look at before making a decision. 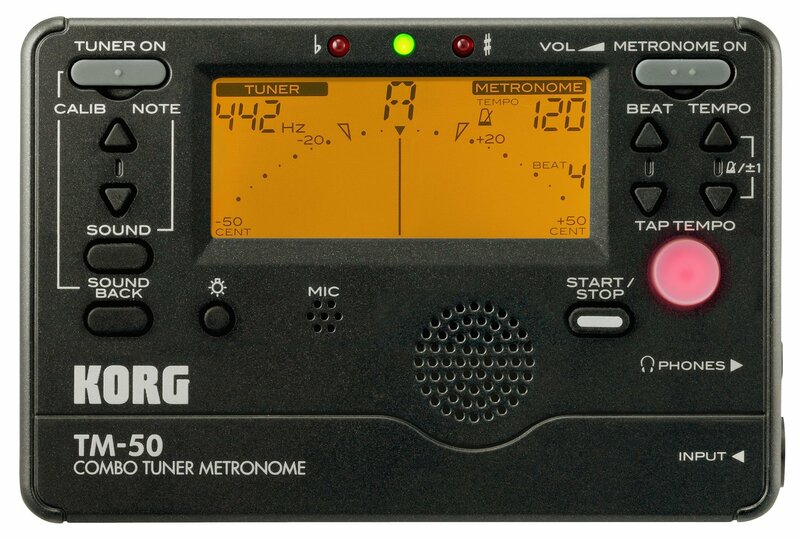 The first metronome on our list is the Korg TM50BK, which is a metronome and an instrument tuner in one. Aesthetically, this device is a great little compact digital metronome. The right hand side of the device is a metronome, which can be powered on by the top right button. You are able to set the beats per measure that you need for each piece of music. The other button on this side of the device allows you to set the tempo. The TM50 allows you to set the tempo anywhere from 30 beats per minute to 252 beats per minute. Once you have the metronome set to where it needs to be, there is a start/stop button which will start the rhythm. Once the metronome begins, you will see a digital pendulum as well as a red blinking light that comes from the button on the right labeled tap tempo. If you need to adjust the tempo, simply press both of the arrows that adjust the tempo to unlock the function and you will be able to freely change the tempo. There are 15 rhythm variations available on this metronome, which gives you signatures zero through nine as well as other options that you may need. The right side of the Korg TM50 is a tuning device that can be used to make sure your instrument sounds as nice as possible. You enable this function by turning on the power button on the left side of the device. After the feature is activated, press the sound button. Then, you can choose the note that you need to tune your instrument and make sure it is correctly tuned. When you are tuning your instrument, make sure that the microphone on the device can pick up the notes that you are playing. Tuning is available on this device from a C1 octave to a C8. If the instrument is in tune, then the green light at the top will glow. If not you will see either the left red button light up, which indicates that your notes are flat, or the right light will light up, which means that your instrument is sharp. There will also be an indication to tell you how off key you are on the LCD screen that is located on the device. This screen is backlit so that you can easily see the metronome and the tuner function. The backlighting can also be adjusted to the level of your liking using the button that is located beneath the screen. There is also a sound back function that will help you determine the tone you need to play during a set. Another great feature that you will find useful is the fact that you can use the tuner and the metronome at the same time. The TM50 also has a headphone jack and an input jack on the right side of the device. There is also a volume knob on the top above the metronome power switch. This device has a kickstand that allows you to place the metronome in a location that can be easily seen. This device takes two AAA batteries, and if for some reason you forget to turn the device off when you are done using it, it will auto shut off after 20 minutes. In addition to saving your battery life, this feature will also save the tempo, beat, and rhythm calibrations that you have specified during your session. Our silver pick takes us back into the mechanical world. The Cherub WSM-330 is a great compact metronome that has a beautiful aesthetic design that will look great in any music room or on top of any piano. It is designed from a black plastic material that is very sleek and stylish. The Cherub comes in a cowbell like shape that is designed to be durable through extended use. The look is then completed with the silver details on the metronome and the silver pendulum and counterweight. Since this metronome is not digital in the least, it has mechanical aspects like gears in the inner workings of the device. In addition, there is a small wind up knob on the right hand side of the metronome, which is used to keep the gears and the counterweights moving internally. Because of this function, batteries are never needed to keep time. When the metronome is in use, the pendulum will swing back and forth. The tempo can be set in any range from 40 beats per minute to 208 beats per minute, which allows you to keep the beat in a wide range of music. Each beat can be heard by the sound of a woodblock chop, which is a traditional sound that can be heard from most metronomes. On the down beat of each measure, you will be able to hear a bell chime as well. The bell can be adjusted to accommodate any size measure, whether the tempo is in two four rhythm or a three four rhythm. You can also set this metronome so that the bell does not ring at all if you prefer. No matter how loudly you play your saxophone while practicing for your jazz gig or how loudly you strum your guitar, you will never be able to drown out the sound of the woodblock coming from the metronome. Chances are that if you cannot hear it, you need to rewind the device. The tempo of the metronome can be adjusted whenever you need. Simply stop the pendulum from swaying, and then move the counterweight to the position you need it to be in. You will be able to tell exactly how many beats per minute it is set at, because the markings on the metronome are numbered to give you the precise tempo, which is never off by more than one percent. Simply place the top of the counterweight at the tempo you need and swing it from side to side. Right down the center of the metronome there are a lot of musical terms that are written in Italian to describe the tempo at that specific location. When it comes to reviews, the Cherub WSM-330 has over 350 on Amazon alone. Out of all of the reviews on the site, 78 percent of the reviewers gave this metronome a rating of four or five stars, which means that over three fourths of the reviewers had a positive experience with their purchase. Music teachers and parents both love this device for the simplicity of teaching children how to keep time with it. Our Bronze pick, which is the Seiko SQ50-V, is a metronome that is simple to use and easy to look at. It is designed from a durable plastic material that has been shaped to include smooth contours and an overall aesthetically pleasing look. It comes complete with s glossy black finish that fits the décor of any music room. 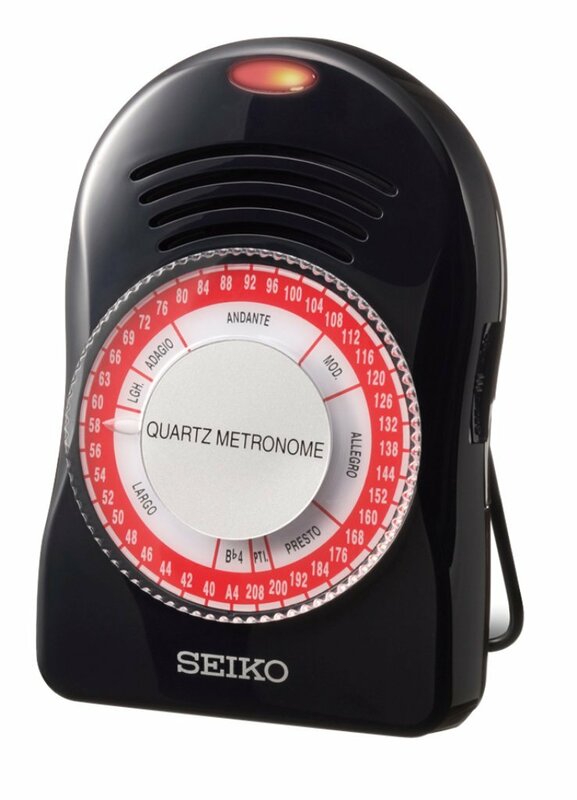 This quartz metronome is designed to be simple and easy to change the tempo as well as the volume. The red outer ring is what controls the tempo. Simply turn the dial to the location that you need. The tempo can be set anywhere between 40 beats per minute to 280 beats per minute. The white ring is labeled with music terms as well. There is also a dial that controls the volume of the metronome. You can choose from two different wood block tones, both of which are pleasant on the ears and easy to play in tune with. The tones are easily loud enough to hear over a loud instrument, but if you cannot have the volume turned up, there is a LED beat light that can also help you keep time, which is located on the top of the device. There is also a headphone jack that allows you to hear the beat in your head as you play along to the music. In addition, there is a fold out wire stand that is located on the back of the device to help you place it in a good position while you are jamming out. This device is not only a metronome; it is a tuner as well. It is capable of tuning an instrument in an A key, which is 440 Hz, or a B flat key, which is 446.16 Hz. Unfortunately not all instruments can be tuned on this device, but a large majority of them can be. In addition to all of this functionality, this metronome only runs on a nine volt battery, which is confirmed to last for a long time, even with continuous use. Musicians cannot always purchase top of the line devices and accessories to better their music, but our ballin’ on a budget pick gives you the option of having a quality device without breaking the bank. 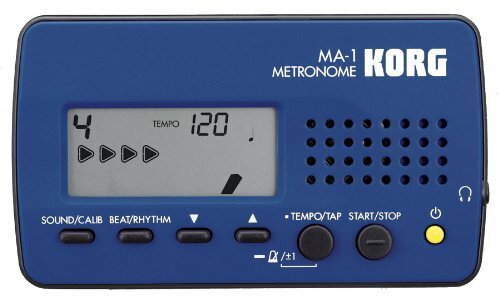 The Korg MA1 is a digital metronome that can be purchases in a red and black style or a black and blue option. There are two different tempo step options with this device, one is the pendulum step, and the other is a full step. You can choose to set the metronome to any tempo between 30 beats per minute and 252 beats per minute. In addition, there is a tap tempo button that is used to quickly select a tempo. Once the metronome tempo is set, it will play the first beat of each measure at a slightly higher pitch, which is another audio cue to help you keep time more efficiently. There is also a beat and rhythm button that allows you the opportunity to select between nine different beats as well as eight additional rhythm options. One feature that you might find useful is the beat display that uses triangles to indicate each beat in a measure. There is also a tuning feature on this device, which uses 12 step chromatic reference pitch to allow you to tune in a range from C4 to B4. If you get tired of hearing the tuning tone, you can always mute the sound and use the readings on the LED screen to see if your instrument is in tune. There is also a volume knob on the right side of the device and a headphone jack where you can listen to the metronome yourself. This is extremely useful if you live in a house full of other individuals who may not want to listen to your ticking metronome. The MA1 runs on two AAA batteries that are designed to last for at least 290 hours of continuous play. If you happen to forget to turn off your metronome, there is also a power saving safety that will automatically turn off the metronome after it is not used for a while. It also has a memory feature that saves all of your session settings before it shuts down. There are two different types of metronomes; mechanical and digital. The mechanical style is the more classic of the two. It features a triangle base and a metal pendulum that is weighted to be able to be adjusted. The digital type is battery operated. It has the same ability to keep time, but it can also do other things like tune your instrument, provide an LCD display, and give you more options for the audible beat. 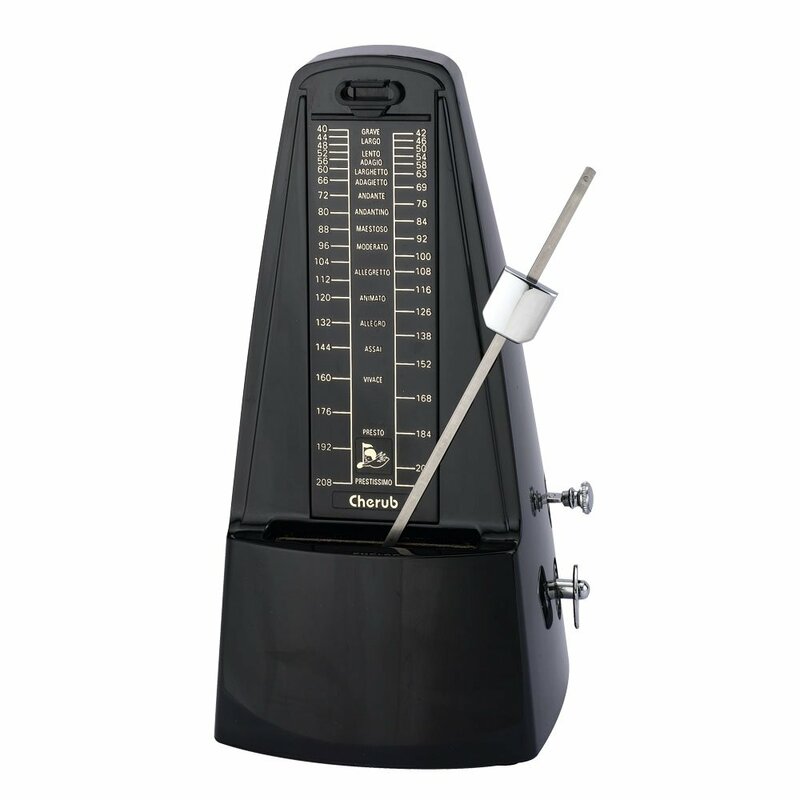 A classic metronome has a slide weight that is designed to control how many beats are in a measure. Electronic models typically use larger radio style knobs and dials to set the pace. Some digital models have LCD screens that display the current beats per minute as well. You want to purchase a metronome that is easy to change tempos on, simply because you will be playing more than one type of music. One feature that is great for a metronome, especially one that is not as loud as you would like is a LED indicator light that stays in time with the tempo you set on the device. A bell, a drum beat, or another sound can be an indication of the beat, but remember that you are playing an instrument, so hearing such an insignificant sound may be nearly impossible. You may prefer something that offers a more visual cue, like a blinking light or a swinging pendulum. Also, if you decide to purchase a digital metronome, remember that some sounds can be unpleasant to the ear. Beeps and electronic sounds may be loud enough to hear over your music, but it may be an annoyance that you would sooner do without. Decide which cue’s are best for you before you decide which metronome you are going to purchase. Not everyone wants a bulky metronome in their living space when guests come to visit, but if you decide to make it part of your everyday look, then maybe you will want to purchase a wooden metronome or something with a sleek design that will not stand out too much in your living space. On the other hand, you may want something that is more the size of a keychain that you can easily slip into a drawer when company arrives. There are a large variety of options available, including metronomes that can even fit on your guitar strap. Sometimes you may want a metronome for other purposes other than keeping time. Some metronomes include a chromatic tuning option that is sure to come in handy, especially if you often play your instrument on the go. In addition, some metronomes have a digital time display so that you always can know what time it is as you are keeping time and playing your guitar. Another feature that may interest guitar players, specifically acoustic guitar players, is a hygrometer. This addition tells you the humidity levels in your home or music studio and helps you adjust to a level that will not cause damage to your instrument. Metronomes can be a great tool for a musician to become something amazing, but deciding which one is perfect for you can be a tedious task. As a musician, it is hard to decide whether to keep it simple and go mechanical or to grab on to today’s technology and go with the more digital option. This is only one of the decisions you have to make when purchasing a new metronome. You will also need to decide what rhythm options you want available, the tempo range you will need, and whether or not you need a tuner to be included in the metronome. Which metronome is going to be perfect for your musical style? We have started the legwork for you, and hopefully our guide will lead you down the path to finding a metronome that is the perfect purchase for you.